[40k] The Swordwind rises once more!, New Codex? New paintings. Crimson Hunter and Hawks! 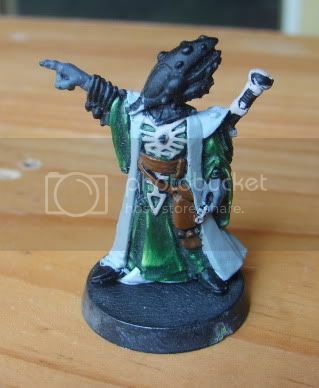 My name is Asher, you may remember me from diaries such as Leapin' and Hoppin' on a Warpshadow, Death Heffalumps, My Swordwind and most importantly Putting all my chump friends to shame. This diary will be a sort of follow on from the Swordwind plog as I intend to take Eldar to ][con this year. Teaming up with my is my good mate Strat, who you may know on the boards as zetaplus who has totally put models to gether and undercoated them in both Space Puppy and Titan flavours. As you may notice, he doesn't do a lot of painting, so a Tournament 2 months from know seems like a good way of modivating the slack arse to get some paint on models! Naturally he has chosen ORKS as he is an uncouth barbarian. My biggest hurdle with my Eldar is the Troops choices. They're also what killed my enthusiasm for the project last time. I'm going Biel-Tan Swordwind, so all aspect warriors all the time and the prospect of painting 20 Dire Avengers and making both units look unique did not overly appeal. So, for this time around, I'm going to limit myself to one unit of Avengers and take some Rangers to fill out my second troops (if I can find them). 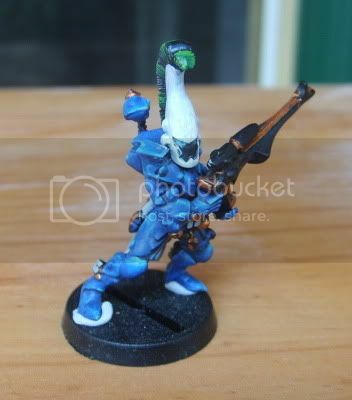 I've sculpted up a set of 15 in the style of the ones I did for my previous Eldar models. 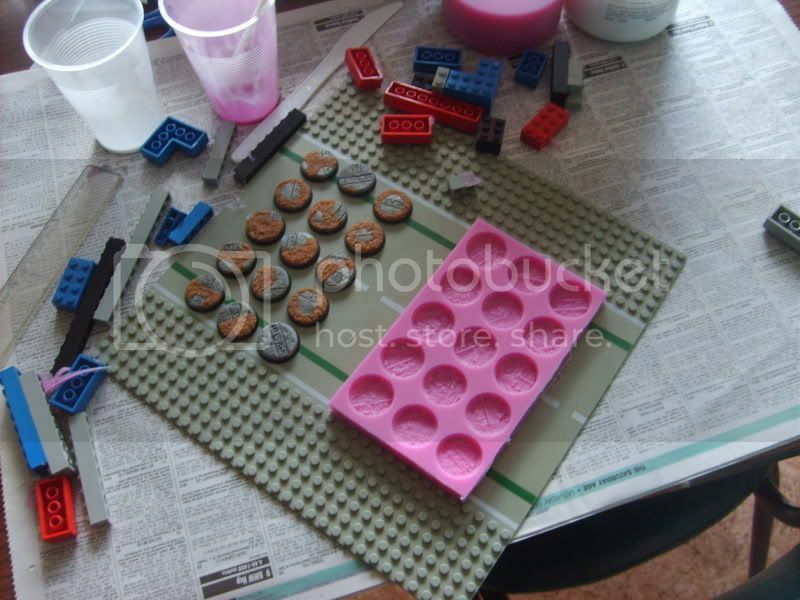 I'm going to make a mould today and hopefully I'll be able to cast up enough for the entire army. 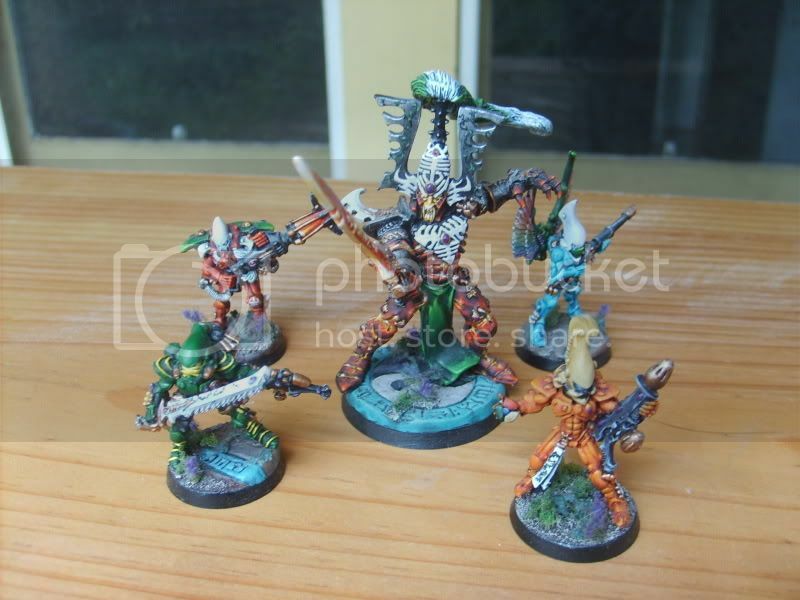 The five Eldar I already have painted. . . I dunno how many of them will even make it into my ][con list. A Dire Avenger. He is ugly and I hate him. I credit him with the complete destruction of my resolve to paint an Eldar army. Aaaaand finally my Farseer. Not sure whether I'll take him or the Avatar this time around. I may get around to finishing him some day. FW Avatar IMO. Also, ORKS! double beds are kinda mandatory if you want deh ladeez to hang around. Nothing says cheap more than a grown man sleeping in a single bed, unless it's a single mattress on the floor. Because that says 'smack addict'. Nice post jerk. Where's the rest of your stuff? I am interested to see how this works out. 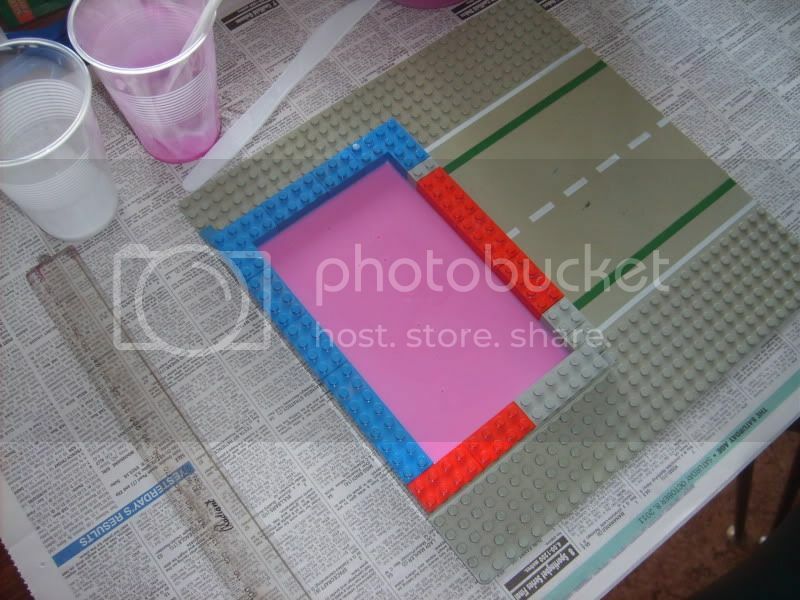 If your mould works, maybe you could make enough extra bases for Strat's Orks for army cohesion. What story are you going with to bring the orks and elder together (maybe take inspiration from DOW 1). It could be worse, you could be allying Chaos and Grey Knights. I assume strat's army will have some sort of homosexual theme ? That's what I was thinking. Basic justification so far is that The Eldar have been fighting the Orks to try to clear them off a maiden world but a new greater threat shows up! So the Eldar start manipulating the Orks into fighting against this greater threat. I like the idea of basing both armies the same way, but Strat's against it because he is stupid. 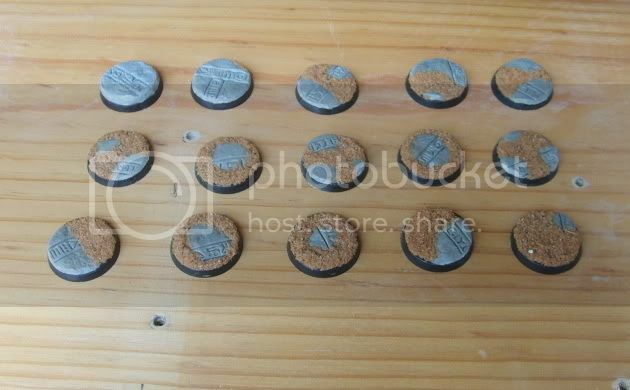 Why don't we base your army on Secret Weapon Bone Fields bases? They'll fit about as well as fairy Eldar bases polluting my dear orkses. So you're invading my planet without stepping foot on it? Cool story bro. It's a maiden world, not a craftworld. I have successfully achieved bases. Pictures to follow! 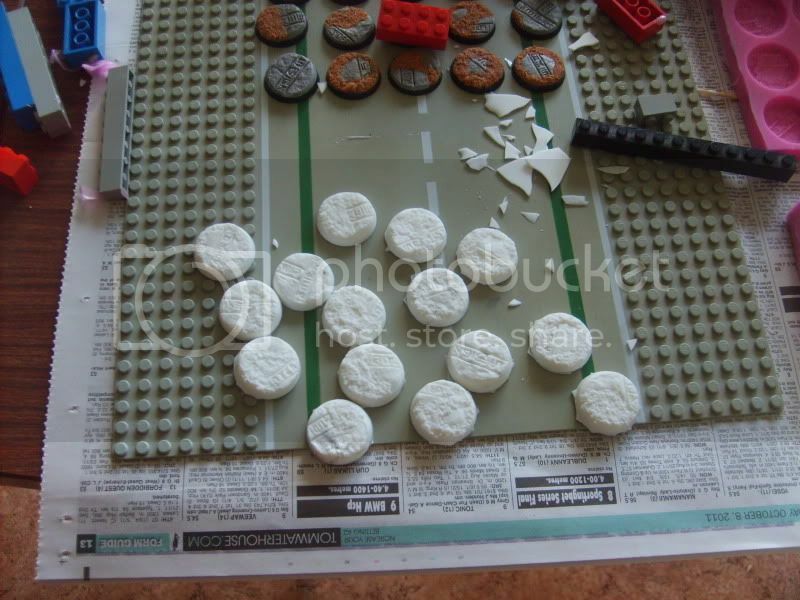 Rebuttal: Do my existing bases look like a craftworld you imbecile? Well the minis look tops. So totally subbed on that part. 2ndly the banter is hilarious so doubly subbed!! The interesting part will be to see if you can get strat to paint his army in time, or will he have to go begging someone to lend him painted orcs. Other than that, nothing of note except smashing Ryland that one time. Step 2: Admire the Mould! 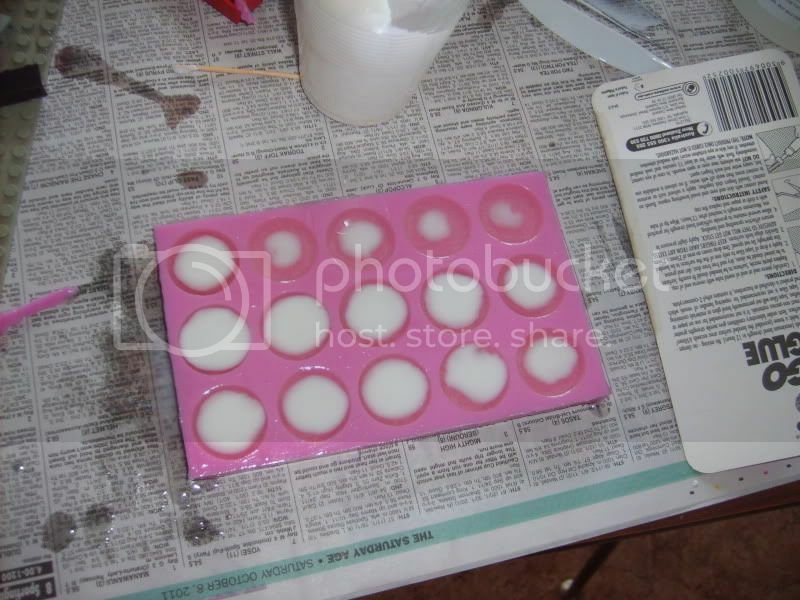 Step 3: Apply resin vigorously to mould. I can't find my Rangers, which is providing me with no end of irritation. they are camouflaged and hiding from you. I'm starting to think I might have given them to Matt and forgotten . . . I'm currently getting a min unit of Scorpions together. Bases still drying.